If you’ve decided to become a welder in South Dakota and look for some useful info, this article is for you. Here you can find a lot of useful info about welding, job options and salary in the state. Also, there is a list of the best welding certification schools in South Dakota. 1.5 Where Can Certified Welders Work in South Dakota? Choosing your future career, it’s important to understand at least some basics of the job. That is why considering becoming a welder, you need to understand the essence of this career. Just read the info below to get a better understanding of this job. Working as a welder, you should be able to complete a variety of complicated tasks. In order to do it, you need to have some personality traits that will help you to become a successful welder. If you miss some of these traits, you can always improve yourself. Just work hard to achieve your goal. Welding, soldering, and brazing are rather similar processes. All of them – it’s a process of joining metal pieces together. Nevertheless, there is one significant difference between welding and two other methods. Welding doesn’t require any additional materials while in soldering and brazing there are used so-called fillers. Also, welding requires a higher temperature while for soldering and blazing 850 degrees Fahrenheit or lower is enough. Those individuals who want to become a welder need to enroll in a welding training program. After completing it, you’ll be asked to pass some tests to prove your proficiency. You should know that all the tests are created by the American Welding Society (AWS). In fact, there are about 100 welding methods but most of them aren’t so popular while Stick, MIG, and TIG are the most widely used. Where Can Certified Welders Work in South Dakota? There is the whole bunch of industries where certified welder can work in South Dakota. 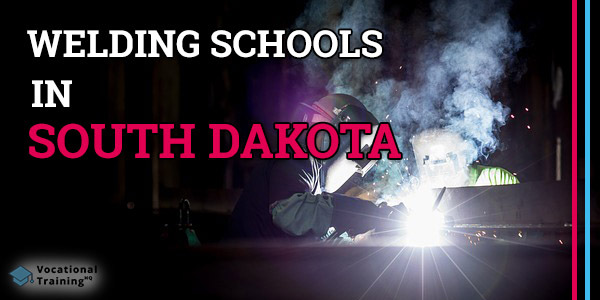 There are 9 welding certification schools in South Dakota. There are high-schools, colleges, job corps centers and technical institutes in the list. Huron High School is a welding school that is located in Huron, South Dakota. It’s a small school and it has a graduation rate of about 80%. Leola High School provides a welding training program for juniors and seniors who earn their high school diploma at the same time. Mobridge-Pollock High School offers a welding certification program. It is located in Mobridge. Montrose School District has the Entry Level certification program for welders. Sunshine Bible Academy is a Christian-based school for kids with a welding program. It’s a boarding school with grades K-12. Boxelder Job Corp Center is located in Nemo. As well as other job corps centers in the United States, it aims to provide young people with the skills they need for technical careers and/or further education. Its welding program lasts for 8-12 months. Western Dakota Tech Institute is one of the Top Welding Schools for Certification in South Dakota. It has Welding & Fabrication program that includes technical training, hands-on learning, and the necessary entry-level skills. Southeast Technical Institute is located in Sioux Falls. It has more than 50 “fast-track” career programs. It is known as one of the top 150 community colleges and has an award of the Aspen Prize. Mitchell Technical Institute offers 25 Associate Degree programs and 15 Certification programs, including welding. You should know that there is a shortage of welders in the USA. It means that you’ll be able to get a great career with an excellent income. Working as a welder in South Dakota, you can earn a median salary of $36 040 per year or $17.33 per hour. At the same time, the top 10% of welders in the state earn about $47 160 annually. Now, as you’ve learned about welding, you can make a final decision. Choose the school you like and start your training. We believe that you’ll achieve your goal and become a successful certified welder.